Lovers. Warriors. Fugitives? Discover the secrets behind the blood stained love affair between Fathoms villainous Killian and Anya in this self-contained one-shot special. 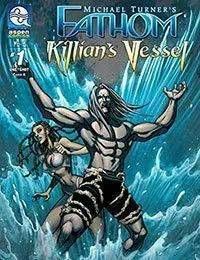 Ripped from the pages of the original Killians Tide series, the nefarious Killian finds himself on the run from the Blue as a fugitive, wanted for killing his brother Sear yet he hasnt lost his appetite for killing humans. But, surrounded by death, the spark of life begins for one of Fathoms most compelling characters!